Glee may be over for the season but you don't have to have Glee withdrawal because the Glee: The Music, The Graduation Album is here to keep you singing and dancing to all your favorite songs from the show!! 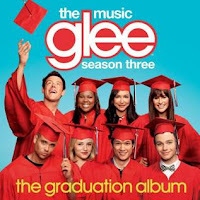 The commemorative release captures the bitter sweetness of senior year with the Glee cast’s triumphant versions of Queen’s “We Are The Champions,” Lady Gaga’s “Edge of Glory” and Jason Mraz’s “I Won’t Give Up.” Also included in this collection is the Glee cast’s version of “We Are Young” by fun., which sold over 137,000 tracks in its first week and debuted at the top of the digital charts (see below for full track listing). From the anthem hit “Don’t Stop Believin’” to the pop phenomenon “Teenage Dream” to the widely praised mash-up of Adele’s “Rumour Has It” and “Someone Like You,” Glee has sold more than 43 million songs and over 12 million albums worldwide. Glee scored three consecutive #1 releases with Glee: The Music, The Power of Madonna, Glee: The Music, Volume 3 Showstoppers, and Glee: The Music, Journey To Regionals. The RIAA has certified Glee: The Music, Volume 1 and Glee: The Music, The Christmas Album Platinum (sales in excess of 1 million units) as well as Glee: The Music, Volume 2, Glee: The Music, Volume 3 and Glee: The Music, Volume 4 Gold (sales in excess of 500,000 units). This album to me might be their best one yet! I loved every single song on this Graduation album and they definitely picked the best songs of the show to feature on the CD! If you love the show Glee or just love current songs sung in a fun, unique way, then you have to get Glee: The Music, The Graduation Album today!